Why is support for RAW files necessary? Images from RAW files cannot be directly displayed, as a RAW file captures raw sensor data that has to be decoded and interpreted first. Because each camera has its own RAW format and because each sensor has different characteristics (color rendering, noise, etc. ), each camera needs to be calibrated in order to optimize support for its RAW files. How can I know if DxO OpticsPro supports my camera’s RAW format? You can check if DxO OpticPro supports your camera’s RAW format by going to our Supported Equipment page. This page lists the equipment that is supported by the most recent version of DxO OpticsPro. If you own an older version of the software, it is possible that your equipment is not supported even if it is listed on the Supported equipment page. If you have DxO OpticsPro version 8, here is the list of equipment that this version supports. Do I need to download a special module so that my camera’s RAW format will be supported? No, support for RAW files is an integral part of the application and does not require any additional downloads or installation. On the other hand, you may need to upgrade your application if you do not have the latest version. How much time does it take for a new camera to be supported? We try to support new equipment as quickly as possible, giving priority to the most widely-distributed models. The most popular cameras are generally supported right after they appear on the market or in the month following. For less-popular cameras, it may be necessary to wait a few extra months. We list the equipment that we plan on supporting in the short term on this page in the section “Available DxO Optics Modules“. If your camera is not on the list, you can ask that it be supported via this form. Do I have to pay for upgrades that support new cameras? Added support for new cameras happens via regular upgrades of DxO OpticsPro (usually about once a month on average). If you have a license for the latest version of DxO OpticsPro, these upgrades are free. You can see what the latest upgrade is by selecting the application’s Search for upgrades command (Help menu for PC, DxO OpticsPro menu for Mac). If you own a license for an older version, you will need to buy an upgrade to the latest version via your customer account. If my camera isn’t supported by DxO OpticsPro, can I convert my RAW files into DNG files (a universal format)? DNG files do not contain all of the calibration data that DxO OpticsPro needs to optimally interpret the RAW data (for example, the precise characterization of sensor noise). This is why DxO OpticsPro does not process DNG files taken directly from the camera nor following conversion from a supported RAW file. What is an Optics Module? Vignetting (darkening of the image periphery). Distortion (deformation of straight lines, which can be more or less noticeable depending on the category of lens you use). Chromatic aberration (colored fringes visible along strongly-contrasted edges). Lack of sharpness (i.e., how sharp your images appear to be). How can I know if there are Optics Modules available for my equipment? 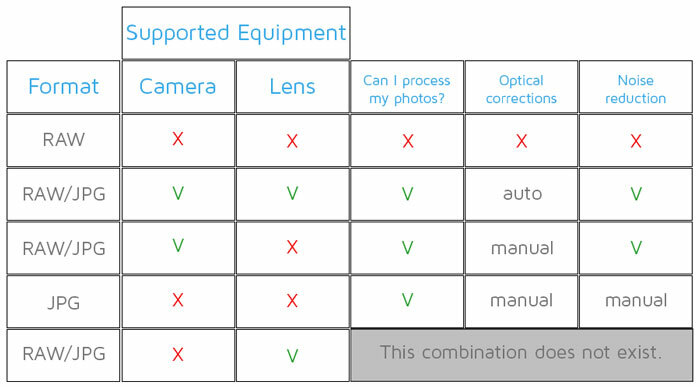 You can see if there are Optics Modules available for your camera/lens combinations by going to Supported Equipment page. Why do DxO Optics Modules correspondent to a camera/lens combination instead of just to a lens? As you can see from DxOMark measurements, a lens’s performance can vary greatly depending on the camera it’s mounted on, so correcting optical defects requires taking into account the specificities of each camera. For example, the sharpness correction applied by an Optics Module is influenced by the sensor resolution, the presence or absence of a low-pass filter, the sensor’s noise characteristics, etc. It must also compensate for any possible corrections embedded in the camera, which is particularly true of JPEG files, for which corrections are often irreversibly applied. An Optics Module is available for my equipment. How do I download and use it? When you open a folder for the first time that contains a file with images taken with one or more supported combinations, DxO OpticsPro automatically offers to download the corresponding Optics Module(s). After the Optics Module is downloaded, it is automatically installed and its corrections are applied to the photos taken with the supported combination. Do I need to restart the application after installing Optics Modules? No, the installation and use are immediate, and so do not require restarting either the application or your computer. What can I do if there isn’t an Optics Module available for my equipment? Even if there isn’t an Optics Module available, you can still correct optical defects manually. Please see this dedicated tutorial for more information. You can also request that we produce an Optics Module for your equipment by filling out this suggestion form. Why aren’t there Optics Modules for certain lenses? Your lens is too recent, so the Optics Module hasn’t been produced yet. In this case, just be patient! You can consult the provisional planning list here. Your lens is too old or too rare. We try to calibrate the lenses that are used the most, so do not hesitate to send us this form to let us know that you would like us to support your equipment. Your lens doesn’t have electrical connections to send data to your camera (often the case with manual lenses). This means that the combination cannot be supported because Optics Module corrections are based on the identity and shooting parameters found in the image metadata. This said, you can still apply manual corrections, as explained in our tutorial, “Correcting lens defects without a DxO Optics Module”. Can I find out what DxO Optics Modules are being planned? Yes, you can consult the provisional planning list for new Optics Modules, and even suggest adding an Optics Module by selecting DxO Optics Modules in the DxO OpticsPro menu. How can I tell if a camera/lens combination isn’t supported by an Optics Module? in the upper right corner of the thumbnail in the File browser. Are recent Optics Modules available for older versions of DxO OpticsPro? For the cameras these versions support, we still publish new Optics Modules for DxO OpticsPro 10, 9 and 8. I would like to deactivate or modify certain corrections automatically applied by an Optics Module. How can I do this?